Moving beyond polemical debates on globalization, this study considers complex intersections of gender, race, ethnicity, nationality and class within the field of globalized labor. As a significant contribution to the on-going debate on the role of neoliberal states in reproducing gender-race-class inequality in the global political economy, the volume examines the aggressive implementation of neoliberal policies of globalization in the Philippines, and how labor export has become a contradictory feature of the country's international political economy while being contested from below. Lindio-McGovern presents theoretical and ethnographic insights from observational and interview data gathered during fieldwork in various global cities—Hong Kong, Taipei, Rome, Vancouver, Chicago and Metro-Manila. The result is a compelling weave of theory and experience of exploitation and resistance, an important development in discourses and literature on globalization and social movements seeking to influence regimes that exploit migrant women as cheap labor to sustain gendered global capitalism. 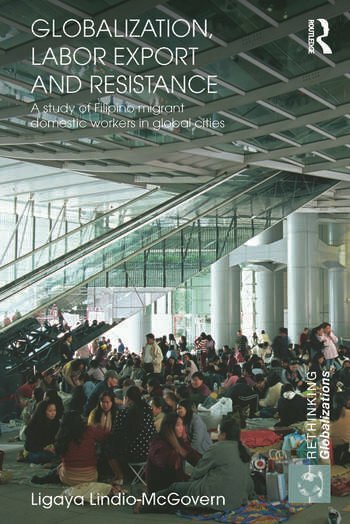 Globalization, Labor Export and Resistance: A Study of Filipino Migrant Domestic Workers in Global Cities, is an invaluable resource for scholars, researchers, policy makers, non-governmental organizations, community organizers, students of globalization, trade and labor politics. It will be useful in the fields of women/gender studies, labor studies, transnational social movements, political economy, development, international migration, international studies, international fieldwork and qualitative/feminist research. Ligaya Lindio-McGovern is Professor of Sociology at Indiana University Kokomo, USA, author of Filipino Peasant Women: Exploitation and Resistance, and co-editor of Globalization and Third World Women: Exploitation, Coping and Resistance, and Gender and Globalization: Patterns of Women’s Resistance.